I own a fair share of blouses, but this one from Zara has been a long time favorite of mine. The cut, stripes, puffed shoulders and 3/4 length sleeves make it the ideal top to wear with just about anything. Instead of pairing it with jeans, I decided to change things up a bit and opted for a black circle skirt, heels and my extra large bright clutch. Happy Monday everyone! Very lovely look - and bag is soo nice!!! LOVE this look! That clutch is amazing! LOVE that top so much & the pop of color from your oversized bag is perfect...so cute! LOVE that striped top, Audrey! That color green looks so pretty on you! P.S. That oversized clutch is so maj! i LOVE the sleeves on this blouse! the puffed shoulders just make it so feminine! Love that blouse! It really would work with just about anything! As always, I cannot believe you have an infant! Love that pop of color in that over sized clutch! 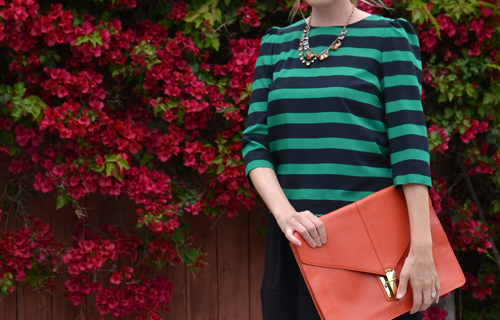 Love the classic vibe of stripes, and that colorful clutch stole my heart! You're so chic! I'm so glad we got to meet at Lucky FABB! Hope to see you again soon! A very nice blouse indeed. I love the cut and colors. You look adorable! I love the mix between casual and dressy. Hence, casual glamorous :) you do it well! Kinda obsessed with this look Audrey! Just gorgeous and fun.